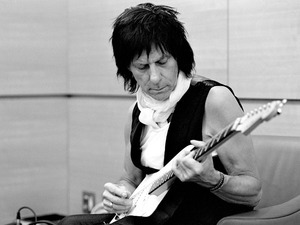 Sample Jeff Beck's "Emotion & Commotion" Tracks at NPR! Just discovered this at The Guitar Channel. NPR Music recently featured a nice little plug on Jeff Beck in anticipation of his upcoming April 13 "Emotion & Commotion" release. Included are streaming tracks from the album! So check 'em out at the NPR link above. I'm there!!! You're not likely to hear anything this ultra sophisticated & dignified from anyone else who plays guitar with their bare knuckles. We're talkin' milestone here folks! Maybe time for me to start blogging about the clarinet, and let JB have the final word.